Here's a clear allusion from the Old Testament -- God's own testimony about the perspicuity of Scripture. Note what commentator J. Alec Motyer says: "the world vision of verses 14–17 is to be understood in the light of revelation. In quiet rebuke of the allegation (Is. 45:15) that he 'hides himself', the Lord asserts that he never spoke in secret (lit. 'under cover'): his word was openly available; nor in a land of darkness where one might lose one's way: his word was intrinsically plain and straightforward; and it led them straight to himself: his word was not in vain, [it was] solid ground not shifting sand. What he said was truth and right: the former is 'righteousness', conformity to the absolute norm of divine truth; the latter is 'plain, straightforward', without deviance or duplicity. God’s word does not need a Magisterium to interpret it. He does not speak “under cover”. His word was intrinsically plain and straightforward; it leads straight to himself. First of all where is the reference to Scripture in those passages? Also, in case you did not know, the Jews also had an Oral Word that aided their understanding of the Written Word, usually referred to as the Oral Torah. Mr. Bugay, Are we to assume then from your presentation that the passages found at Exodus 18:13-27, Numbers 11:14-17, Deut. 1:13-18, Deut. 17:8-11, and 2 Chronicles 19:4-11 are superfluities and should be disregarded or did some nasty medieval pope build a time machine and insert those passages into the OT so he would have something to hang his tiara on? Matthew -- that was from Isaiah 45:18-25, as I noted immediately following the Scripture selection. And yes, I was aware that the Jews also had an oral tradition, which Jesus did not think very highly of. Paul Hoffer -- Those passages that you listed refer to the civil government of Israel. Israel, of course, was founded to be a theocracy. And the establishment of a judiciary was a key component in their civil government. On the other hand, note what God himself is saying in these verses. Don't think for a minute to try and pit God's word against God himself. God himself says, "I did not say to the offspring of Jacob, 'Seek me in vain.' This is Christ's word, "Seek and you will find." The object of the search is to be God himself. The juxtaposition here of the "assembly," which in the Old Testament is qahal, or congregation, (and of course "the nations" being the Gentiles), is a reference to "God's people" under the continuing covenant of Grace. I know you're not saying that the church has no authority but my question is this; how do you interpret Matthew 16:18? Rich, I am at work and don't have time for a detailed explanation right now. You of course are hinting at the reference to the "keys," which itself is a reference to Isaiah 22. "Eliakim is, therefore, inevitably a person on whom much depends. He has authority and responsibility for its proper exercise; people need his fatherly care, and the whole structure of the state needs him to hold it in place. Everything then depends on how he sees himself and how he allows others to see him. It is not just that leadership position can become pride of position, national welfare be replaced by family interest, public good by nourishing a crowd of 'hangers-on', but that the Lord as the object of trust can be replaced by a human object of trust. Just as the individual is not sufficient for himself (Shebna) neither is he sufficient for others (Eliakim)." Motyer suggests that these verses are not a prediction, but a hypothetical: "Should he, however, become ... and they hang up on him ... in that day the peg will give way ..." Corrupting power may tempt Eliakim to self-importance and to yield to adulation. "Give way ... be sheared off" The collapse will come about by internal insufficiency ('give way') and external force ('be sheared'), for only the Lord is sufficient and he will allow that position to no other. 'For the Lord has spoken" -- to the principle that he alone must be trusted. (157-158). Revelation 3:7 declares explicitly and ultimately who has the key: 'The words of the holy one, the true one, who has the key of David, who opens and no one will shut, who shuts and no one opens..."
In the original Greek the "binding and loosing" language is actually saying, "what you bind on earth, will have been bound in heaven" etc. The pattern is struck in heaven already. What happens on earth has been set in place "before the foundation of the world," (Ephesians 1:4). Peter, of course, is in the conversation here in Matt 16, and Roman Catholics tend to think that anything that is said about Peter refers to to the papacy. But it is a bold and dangerous thing for Rome to claim all the blessings of Peter for itself, and the verse in Isaiah that you use is about as stern a warning against the notion of a papacy that you can find. Commentary after commentary that I've seen on Matthew states that, whatever the promises are to Peter -- and the very content of these promises is unclear -- there is absolutely no hint of a reference that these will be passed on to anyone else. "Also, in case you did not know, the Jews also had an Oral Word that aided their understanding of the Written Word, usually referred to as the Oral Torah." Yes, we know that Pharisaic Jews did invent the concept of "oral Torah" to uphold their corrupt traditions. I would not be so eager to compare myself to them. But we Prods are quite ready to see RCs as New Covenant equivalents of Pharisees. "Matthew alone has preserved the material of vv.2-3. The imagery of sitting in the seat of Moses has not been paralleled. It is normally taken to mean to have authority to interpret for people the demands of the Mosaic law. But this is difficult, given that the same people to whom the sitting is applied are identified soon after in v. 16 (cf. 15:14) as 'blind guides'. Powell identifies ten different approaches to dealing with this tension, but as he clearly shows, none is satisfactory. The only Jewish reference to 'the seat of Moses' in Talmudic literature seems to be "Pesiq Rab Kah 7b", which says that King Solomon's throne 'resembled the seat of Moses'. Though it might be possible to refer 'seat of Moses' to a heavenly throne for Moses, a link to an item of furniture in some synagogues seems more likely, though such an item in its turn may be intended to represent a heavenly throne. Surviving ancient stone chairs from synagogue ruins seem to have been designed to hold scrolls of Scripture. Nolland calls this a "reasonable conjecture" (923). One other possibility that he presents is that "Jesus may simply be acknowledging the powerful social and religious position that [the scribes and Pharisees] occupy in a world where most people are illiterate and copies of the Torah are not plentiful. Since Jesus' disciples do not themselves have copies of the Torah, they will be dependent on the scribes and the Pharisees to know what Moses said ... In light of such dependence, Jesus advises his disciples to heed the words that the scribes and Pharisees speak when they sit in the seat of Moses, that is, when they pass on the words of the Torah itself (citing Powell). We might say that the scribes and Pharisees were walking copies of the Law. What they did with it might be suspect, but not their knowledge of it. They could be relied on to report the Law of Moses with care and accuracy" (923). What is not in view here in any way is the Roman concept either of "making new law" or of "interpretation." When Jesus says, "do what they say," it is only insofar as they "report" the actual law of Moses. In the next verse, Nolland clarifies this further, noting "a sharp disjunction. The scribes and Pharisees are a reliable source of information on the Law, but are not to be looked to in other respects." For you to look to this verse as some kind of "proof text" that there was anything at all like a magisterium in view in Matthew goes far, far beyond what's actually in the text. I thought you were an attorney. The passages you cite relate to God's law in the same way that our own judiciary relates to the law of our land. The law is on the books; judges apply that law to settle disputes and so forth. Moreover, it is assumed that citizens can read and understand the law themselves to begin with. Indeed, it is on that basis that they are held accountable to it. It's a bad thing when judges go beyond their role of applying the law and begin to make law, or to "declare" law -- for example, reading privacy rights into the constitution to protect abortion. Likewise, God's church is not to go beyond the written word in presuming to declare things that are not plainly there. "Write these words down, for in accordance with these words I have made a covenant with you and Israel" (Ex.34:27). "Carefully follow all the words of this law, which are written in this book" (Deut. 28:58). "You shall read this law before them... so they can listen and learn to... follow carefully all the words of this law" (deut. 31:9-13). "And yes, I was aware that the Jews also had an oral tradition, which Jesus did not think very highly of." You are confusing the Oral Word of God with other Jewish traditions to which Jesus was speaking of John. God does not go against His own revealed Word, Oral or Written. There is a huge difference. Mr. Bugay wrote: Paul Hoffer -- Those passages that you listed refer to the civil government of Israel. Israel, of course, was founded to be a theocracy. And the establishment of a judiciary was a key component in their civil government. Mr. Hoffer writes: Where to begin...Mr. Bugay, what laws were the Hebraic judiciary interpreting and applying in making their decisions if they were not the laws of God Himself? Exodus 18:15-16: oses answered his father-in-law, "The people come to me to consult God. Whenever they have a disagreement, they come to me to have me settle the matter between them and make known to them God's decisions and regulations." Numbers 11:17: [God speaking to Moses]: I will come down and speak with you there. I will also take some of the spirit that is on you and will bestow it on them, that they may share the burden of the people with you. You will then not have to bear it by yourself. Deut. 1:16-17: 'Listen to complaints among your kinsmen, and administer true justice to both parties even if one of them is an alien. In rendering judgment, do not consider who a person is; give ear to the lowly and to the great alike, fearing no man, for judgment is God's. Deut. 17:8-11: "If in your own community there is a case at issue which proves too complicated for you to decide, in a matter of bloodshed or of civil rights or of personal injury, you shall then go up to the place which the LORD, your God, chooses, to the levitical priests or to the judge who is in office at that time. They shall study the case and then hand down to you their decision. According to this decision that they give you in the place which the LORD chooses, you shall act, being careful to do exactly as they direct. You shall carry out the directions they give you and the verdict they pronounce for you, without turning aside to the right or to the left from the decision they hand down to you. Any man who has the insolence to refuse to listen to the priest who officiates there in the ministry of the LORD, your God, or to the judge, shall die. Thus shall you purge the evil from your midst. 2 Chron.19:4-11:Jehoshaphat dwelt in Jerusalem; but he went out again among the people from Beer-sheba to the highlands of Ephraim and brought them back to the LORD, the God of their fathers. He appointed judges in the land, in all the fortified cities of Judah, city by city, and he said to them: "Take care what you do, for you are judging, not on behalf of man, but on behalf of the LORD; he judges with you. And now, let the fear of the LORD be upon you. Act carefully, for with the LORD, our God there is no injustice, no partiality, no bribe-taking." In Jerusalem also, Jehoshaphat appointed some Levites and priests and some of the family heads of Israel to judge in the name of the LORD and to settle quarrels among the inhabitants of Jerusalem. He gave them this command: "You shall act faithfully and wholeheartedly in the fear of the LORD. And in every dispute that your brethren living in their cities bring to you, whether it concerns bloodguilt or questions of law, command, statutes, or judgments, warn them lest they become guilty before the LORD and his wrath come upon you and your brethren. Do that and you shall be guiltless. See now, Amariah is high priest over you in everything that pertains to the LORD, and Zebadiah, son of Ishmael, is leader of the house of Judah in all that pertains to the king; and the Levites will be your officials. Act firmly, and the LORD will be with the good." There is nothing in those passages that limit the judges' authority to civil governance only. Yes it is true that some matters that judges decided were merely civil matters, but as the above passages make clear, the judges had the authority to settle all quarrels among the people, theological as well as mere civil matters. Their decisions comprise the Oral Torah, Matt B. mentions. One example: Deut 5:14 tells us that we are not to work on the Sabbath. Citing from the written Torah alone, give the OT Jew authoritative guidance as to what constitutes work so that he may keep the Sabbath holy. You will find the answer only in the Oral Torah. As I have written elsewhere (http://socrates58.blogspot.com/2007/11/defense-of-my-opinion-on-james-whites.html), like our US Constitution, the Torah requires an authoritative interpreter. In our system of law, that duty falls to our judicial system since the holding of Marbury vs. Madison, 5 U.S. 137 (1803) wherein the Supreme Court held that it is the final authoritative interpreter of the Constitution and our laws. The Torah likewise shows that the court system established by Moses was given the authority to interpret the Law of Moses a.k.a. the written Torah. I respond, please show me how I pitted God’s Word against God Himself. Rather, what I have done is help give you something to contemplate about the beauty of God’s Word and some insight into how He operates within His creation. You, on the other hand seem to be doing that as I pointed out. Passages from the Scriptures can not be cherry-picked, yanked out of context and be applied as a proof text to support whatever notions you happen to want to justify. Rather, they must be read and understood in the context of the rest of Scripture and as how the Church has applied them in the past. The reason that there is a Magisterium is because God said there was to be one. I respond, I do not disagree with the sentiment expressed in the beautiful words of Our Lord and Savior, Christ Jesus which I recite everyday in my prayers, and as the above passages I cited to show was that one way the people could seek Him in the just decisions obtained from those He placed or His holy ones appointed into the positions of judges. 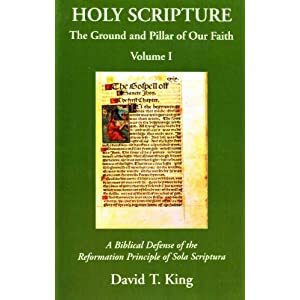 BTW, you referenced some commentators on the Scriptures, J Alec Motyer and Mr. Nolland here, can you show me where in the Scriptures they were appointed by God to play magister and render decisions as to what the Scriptures mean. If your argument is that the Scriptures are “intrinsically plain and straightforward,” why cite to any commentator at all? Isn’t that a bit self-defeating? I respond, “I do not disagree with what you are saying here. However, I would submit that it is also a bad thing to refuse to recognize that the judicial system has the authority to make binding decisions either of which private judgment and the notion of perspicuity are opposed. Your analysis is also somewhat wanting as well as the only reason that the judicial system was invoked at all was because two individuals had a conflict under the law in the first place and asked a court to decide the dispute. #1. One reads the Scriptures and finds that there is no such thing as the “Real Presence” in the sacrament of the Eucharist; another reads the Scriptures and finds that it is there as plainly as can be. How is this dispute to be decided since God did not provide us with a written concordance at the end of the Bible? Clunk each other over the head with their copy of the Bible? #2. One determines that the books of the Scriptures are limited to only to the Hebraic canon. Another determines that the books of the Scriptures are limited to the Protestant canon. Yet another decides that the books of the Scriptures should follow the Catholic canon. Other folks decide that the Scriptures should not include the OT at all. How is this dispute to be determined if the Church is not to go beyond the written word? Unfortunately, when God forgot to provide us with a concordance He also left out an index, too. #3. The written Torah was written originally with only consonants. Hence, in the OT God’s personal name is YHWH or YHVH. Is that Yahweh or Jehovah? Who in the OT got to decide what and where vowels were to be supplied before diacritic marks were invented? When I pray to Yahweh, am I praying to God, the Father or an Ugaritic storm god? Matthew Bellisario: You are confusing the Oral Word of God with other Jewish traditions to which Jesus was speaking of John. God does not go against His own revealed Word, Oral or Written. There is a huge difference. What makes you think I was confusing anything? Ben: Is the pope a greater criminal than Nero? In the case of some popes, yes. 1. The Old Testament law, especially the judiciary, was given for the purpose of civil law; it's true that God was interested in upholding the highest moral standards. Which didn't happen. "infallible magisterium" that somehow developed. 3. When it comes to an "infallible magisterium," I'll ask you a Steve Hays question: "What's the difference between a correct interpretation and an authoritative one?" This seems to be in accord with the kind of judgment Jesus invokes in Matthew 11:21-24. Popes, of all men, especially in contrast to the pagans of old, have uninhibited access to Scripture and the great learning necessary to understand it. They will be judged accordingly. "Paul Hoffer -- I looked up your Scripture citations. I'm not sure why you thought taking up two and a half posts with them would make your point stronger." "When you are invited by someone to a wedding feast, do not sit down in a place of honor, lest someone more distinguished than you be invited by him, and he who invited you both will come and say to you, 'Give your place to this person,' and then you will begin with shame to take the lowest place. That is, the Roman church had some honor that was attributed to it in early times. Rome was the capital of the world, and several councils noted its leading role for this reason. Nicea (325) understood Rome to be overseeing the western European churches, just as Alexandria was overseeing the churches of Africa. Constantinople (381) and Chalcedon (451) both noted that its honor was due this church because it was the imperial capital. But all the while, Rome had its own ideas, and it was, by all accounts, scheming slowly to take more than was given it. But passages like Romans 4-8, well, they can't possibly say what they seem to be saying; "they need to be properly interpreted." Hello Mr. Bugay and Louis, thank you for interacting with me, Mr. Bugay, I will attempt to respond to your comments later today. Louis, your comment about perspicuity is ill-placed. There are many doctrines (or at least broad outlines) upon which most Christians can agree upon. Where the perspecuity of Scriptures falls by the wayside is when there are disputes between Christians as the Scriptures can not arbitrate the dispute. Two people can have sincere differences over the regenerative properties of baptism, paedo-baptism, etc. How does reliance on Scripture help when both parties rely upon them? Fortunately, the Scriptures does point to the fact that through the intervention of God Himself, a magisterial authority was established that people could take such disputes to. Looking at Marbury v. Madison, it might be true that I do not understand every nuance of that decision, but I do not question the fact that the Court has the power to make that decision. When it comes to the Church, I may not understand every facet of my Church's teachings, but I know that it has the power to define, illustrate and teach those teachings. When I referenced the OT passages, I was merely showing that God had established a magisterial authority for Israel to help the people resolve their disputes over how to comply with the Law that God had given them. You made the flippant remark about how would I know what Marbury said without an infallible interpreter, you are right-I may think that I know what that case says, but without a final authority to verify that my understanding is correct, I might be wrong. When if comes to my understanding of the Scriptures, I am humble enough to admit that. Would that you be humble enough to admit that also. Thank goodness God provided us with a magisterial authority to aid us in better understanding His Word. Paul Hoffer, I'll look forward to interacting with you here when you respond, but for now I want to quibble about your use of some words, and I think you'll see why I'm doing it. Where the perspecuity of Scriptures falls by the wayside is when there are disputes between Christians as the Scriptures can not arbitrate the dispute. Two people can have sincere differences over the regenerative properties of baptism, paedo-baptism, etc. How does reliance on Scripture help when both parties rely upon them? No doubt you've seen the expression "In essentials, unity; in non-essentials, liberty; in all things, charity." From what I've been able to ascertain, a form of this statement can be attributed to Augustine. I think it's a fair statement that the "infallible magisterium" had not yet "developed" in Augustine's time, and if this method was good for the early church, I'm going to say, at the very least, this is a method by which Protestants can understand themselves to be part of the same "one true church." And they can do this with great confidence. Further to this, if you stay around and get to know me, you'll know that I rely heavily on just simply an understanding of the languages to clarify a lot of differences. And further to that, we also have the ability to look to history and historical sources to understand how things are done. We do quite well with the principles articulated in the Reformation. As the WCF puts it, "The whole counsel of God, concerning all things necessary for his own glory, man's salvation, faith, and life, is either expressly set down in Scripture, or by good and necessary consequence may be deduced from Scripture: unto which nothing at any time is to be added, whether by new revelations of the Spirit, or traditions of men. Nevertheless we acknowledge the inward illumination of the Spirit of God to be necessary for the saving understanding of such things as are revealed in the Word; and that there are some circumstances concerning the worship of God, and the government of the Church, common to human actions and societies, which are to be ordered by the light of nature and Christian prudence, according to the general rules of the Word, which are always to be observed." Fortunately, the Scriptures does point to the fact that through the intervention of God Himself, a magisterial authority was established that people could take such disputes to. ... Thank goodness God provided us with a magisterial authority to aid us in better understanding His Word. The Scriptures do not "point to the fact" that "a magisterial authority" has been established. At best, the Scriptures point to the fact that a "ministerial" authority has been given. Before you can get away with an assumption like this one here, you will have to argue for its existence. Finally, Louis's comment about perspicuity is very well-placed. If there is one thing about Catholics that we have noticed is that no Scripture is perspicuous unless it is some statement like the one you made about having been provided with a "magisterial authority." "when there are disputes between Christians.... Two people can have sincere differences.... How does reliance on Scripture help when both parties rely upon them?" i. The main reason for the differences between us and you is that you are not in fact relying on the scriptures, but are adhering to another authority instead, or at least in addition to. Actually, it is those who unite the pope to Christ in such a way who have obscured and maimed an accurate view of God. "the Scriptures do point to the fact that through the intervention of God Himself, a magisterial authority was established that people could take such disputes to." The Scriptures do not say this. None of the passages you cited say this. And your view of perspicuity should not even allow you to say this. "I might be wrong. When it comes to my understanding of the Scriptures, I am humble enough to admit that. Would that you be humble enough to admit that also." ii. The pope is not humble enough to admit it. How could he, with a triple-crown on his head? And you apparently are not humble enough to admit that your church might be wrong. Indeed, you insist that it cannot be wrong. Where is the humility there? Matt 15:7 "You hypocrites, rightly did Isaiah prophesy of you: 8'THIS PEOPLE HONORS ME WITH THEIR LIPS, BUT THEIR HEART IS FAR AWAY FROM ME. 9'BUT IN VAIN DO THEY WORSHIP ME, TEACHING AS DOCTRINES THE PRECEPTS OF MEN.'" God will harshly judge the Popes and the Roman corruptions. Mr. Bugay, I apologize for the delay in posting this. I felt that I had to first address the article posted by your friend Rhology. 1. The Old Testament law, especially the judiciary, was given for the purpose of civil law; it's true that God was interested in upholding the highest moral standards. What is your authority for this assertion, particularly in light of passages like Exodus 21:2-22:6? The point I tried (and apparently did not succeed in expressing) is that the “civil law,” as you call it, consists of God’s ordinances and were expressed as a part of the covenant relationship-the whole sphere of justice, decisions, etc. are drawn into the divine economy. For the Hebrews, God is the Judge and the Arbiter (Isaiah 33:22), the people occupying the Moses seat were merely His representatives. The whole of the law was built on the foundation of God’s command to “Be holy as I am holy” Lev. 19:2. “Hear O Israel” was not merely a summons, but an acknowledgment that what God required of Israel was spoken to her. In order to understand God’s commandments, He sent the prophets and provided a process for judges to appointed to proclaim them and to interpret them. The sanhedrins established by Moses had a duel role: to enforce civil law as was pointed out, but they also had the obligation to transmit the Torah (written and oral) in its entirety to the coming generations. “And charging the judges, he said: Take heed what you do: for you exercise not the judgment of man, but of the Lord: and whatsoever you judge, it shall redound to you. Let the fear of the Lord be with you, and do all things with diligence: for there is no iniquity with the Lord our God, nor respect of persons, nor desire of gifts. In Jerusalem also Josaphat appointed Levites, and priests and chiefs of the families of Israel, to judge the judgment and the cause of the Lord for the inhabitants thereof. And he charged them, saying: Thus shall you do in the fear of the Lord faithfully, and with a perfect heart. Every cause that shall come to you of your brethren, that dwell in their cities, between kindred and kindred, wheresoever there is question concerning the law, the commandment, the ceremonies, the justifications: shew it them, that they may not sin against the Lord, and that wrath may not come upon you and your brethren: and so doing you shall not sin. And Amarias the priest your high priest shall be chief in the things which regard God: and Zabadias the son of Ismahel, who is ruler in the house of Juda, shall be over those matters which belong to the king's office: and you have before you the Levites for masters, take courage and do diligently, and the Lord will be with you in good things.” See also, Mal. 2:7. My question to you is why are levites and priests with the Chief Priest of the Temple being appointed to judge the things which regard God if the sanhedrins are merely civil courts? In regards to the OT, I never said that the OT magisterium was infallible. In the New Testament, there is a guarantee of magisterial infallibility because Christ said so. However, to your point, it is not a question of whether we “need” an infallible magisterium, it is whether the Word of God compels that there be one. Catholics hold that the Scriptures do in fact state that there is an infallible magisterium-so the issue of “need” is irrelevant. Your query is not a Steve Hays question, but one I seemed to recall from a child’s catechism decades ago. Hopefully he did not plagiarize it. In the case of the Catholicism. as it defines the role of the teaching authority of the Church, there is no difference. Since the Catholic Church was the Church inaugurated by Christ it is the final authority in matters of faith, doctrine, practice, and in interpreting the Scriptures. I never said otherwise. As St. Jerome says, “Ignorance of the Scriptures is ignorance of Christ.” Of course, he acknowledges the need for a Magisterium too when he wrote, "Remain firmly attached to the traditional doctrine that you have been taught, so that you can preach according to right doctrine and refute those who contradict it" (Ep. 52, 7). The fact that Catholics recognize the importance of having a teaching authority within the Church such as the Magisterium so we know what the Scriptures “say” shows that we are in agreement on this. So I guess what you are really complaining about here is that you claim that your teaching authorities, such as J. Alec Motyer, are somehow more magisterial than the authorities Catholics rely upon in understanding the Scriptures. I am glad to know that. I must ask this though, who is J. Alec Motyer and what century did he write in? A couple more points, I acknowledge your “Immaculate foot” comment. Of course, I could be uncharitable and make a snarky reply about how Calvinists like to tiptoe through the TULIPs but where does that get us? Have we treated each other with courtesy, reverence, and in a hospitable way as we are called to do in 1 Peter 3:15-16 and 4:9 while giving the reasons for our hope? And in regards to your comment to Louis on how Catholics view Romans 4-8, that is a pretty broad patch of Scriptures for me to discuss. What part of the Catholic understanding of Romans 4-8 do you have problems with? Perhaps you could offer some specifics so I can provide you my thoughts on the matter or how I understand the Church’s position on same. Considering that Catholics and Lutherans have reached a joint understanding on the issue of justification, it is hard to imagine that we are that far apart on the matter.